I work at an Israeli Yeshivah High School, a grades 7-12 religious boys’ school. I teach English to five different classes—about 120 students. Despite some initial apprehension about teaching boys, I have come to really enjoy it and feel that I have found a place for myself at the school. Here are some highlights of my first year. My 10th graders take their first literature quiz, and it turns out to be more difficult than I had imagined. Instead of taking one period, it takes two periods, and a significant number of students have not yet finished five minutes before the end of class. Minchah (the afternoon service) follows our class, and attendance is mandatory. They cannot be late for Minchah, but, at the same time, I cannot allow students to take these quizzes home. They are for the Bagrut (national English program). “How many of you are still working?” I ask the class. Ten hands go up. “Come with me to the teacher’s room and I’ll give you a few more minutes to finish,” I explain, gathering my books as the bell rings and students from the neighboring classes clamor to gain access to their homeroom class. “Yes, I know,” I reply, and smile. “There are ten of you.” I seat the students in a side room off the teacher’s room and explain that they have a few more minutes, after which point, they’ll have a minyan, a quorum of ten boys or men above the age of 13, for Minchah. One by one, they finish the quiz, waiting for each other. Shmuel is appointed prayer leader. I gather the papers and head to the teacher’s room next door, saying regretfully that I wish there were a mechitzah (partition) so that I could pray with them. “My most important possession is our holy Torah. I am still alive only for our Torah and I keep its rules. Our Torah shows the connection between us and G-d. When we follow the many rules which are written in the Torah, we help ourselves and strengthen our connection to G-d. The Torah is so important that I am even ready to die in order to keep it. We got our Torah over 3000 years ago from Moses the Prophet. We are all committed to the Torah’s rules, and we will keep it in any situation. I must tell you about the week-long almost-war we had here in the winter. Hamas terrorists launched rockets at the South and center of the country, reaching Tel Aviv and the outskirts of Jerusalem for the first time. Sirens went off all over the country. In school, we are asked to start each class with a chapter from Psalms. I choose Psalm 121, which begins, “I lift up my eyes to the mountains. Where does my help come from? My help comes from G-d…” My students know it by heart, and so we say it together. I read it in English afterwards, in part to expose them to liturgical English and in part for a little comic relief. I acknowledge that our heads are not in our work and that I’ve adjusted the lesson plan to account for that. Nonetheless, we are going to try to focus a bit. Even with everything going on—-several of our male teachers out on reserve duty, several female teachers managing work and family all alone, the news updates—-I am not prepared for this answer. I continue to circulate around the room, quickly reaching Natan and Zev’s table. They’re good friends and both have trouble concentrating. Elchanan can be a bit of a trouble-maker. He has a tough home life and a penchant for belting out popular songs at random moments in class. I shouldn’t let them sit together today, but they seem pretty focused. Only Natan has his phone on his desk. “Natan,” I begin, pointing to his phone and raising my eyebrows dramatically, hoping he’ll take the hint. I take a deep breath again, nodding and motioning with my hand that it’s OK, and then announce to the class that anyone with a father, brother, relative, or friend on the border is allowed to keep his phone out on his desk. At which point the rest of my students reach into their backpacks and pockets and place their phones on the tables. The obvious occurs to me: I am teaching the front lines. Almost every week, one of my eleventh graders misses school when he is called up to the enlistment office for a day of physical and mental tests. The results of these tests determine his profile, which tells him which units he can try out for. It’s called a tzav rishon, a first command. The best, brightest, and strongest of my students will be selected for the most elite units, which often means combat. It is then that I realize that, more than English, the most important lessons I can teach my students are how to be good people. A young man who has grappled with serious ethical dilemmas will be better prepared for urban warfare, for the impossible decisions that must be made when terrorists hide behind human shields. “Yes, Teacher, we know,” he smiles. I can’t resist the teachable moment, and so I tell him quickly about my becoming a teacher in Israel, how everyone discouraged me, but how it is in my bones and I cannot help it. “Yes, Teacher, we know,” he says again, and smiles. I see my 11th graders for the first time after their trip to Poland. 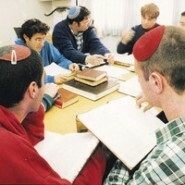 Thousands of Israeli 11th and 12th graders make the trip annually, which is subsidized in part by the government. It’s the culmination of their history coursework (which includes interviewing survivors) and a touchstone of their high school experience. As I take attendance, I ask each student to say one sentence in English about the trip. Some talk about the snow they saw for the first time. Others mention the American girls who were on the flight back to Israel, and how they used English to talk to them. Then it is Avi’s turn. “Teacher, I called my grandmother at the gates of Auschwitz,” he says. “And then she came to Israel?” He nods. “What an incredible experience that must have been!” I pause before going on to the next student. I think about all of the miracles this woman has experienced—-surviving Auschwitz, helping to establish the State of Israel, raising children and grandchildren in that fledgling country. And then I think of the tears she must have choked back when her Israeli grandson picked up the phone and told her, in unaccented Hebrew, that he was standing at the gates of Auschwitz. I am part of a people that has seen its fair share of storm clouds and of rainbows, a nation that knows how to appreciate the latter as a direct result of the former. I remain deeply, deeply grateful for the opportunity to live, work, and raise a family here in Israel. This place is full of rainbows, and it is the place that I call home. Yocheved Cohen grew up in the United States and today lives in Israel with her husband and two daughters. Beautiful and inspiring…thanks so much for sharing! This is so moving. What an inspiring article. The boys are lucky to have her. She is teaching them so much more than English. Thank you. This article makes Israel and Israelis real. I loved the article, her warm approach and the love her students give back in their gentle way. I turned to JewishMom.com for some inspiration on Tisha Bav. I was not disappointed. Yocheved, thank you for this beautiful piece.